Ashram West exists in a one-bedroom apartment in the Silver Lake section of Los Angeles, California, that provides limited use for classes and gatherings and no space for over-night visitors. We are actively soliciting donations to obtain a permanent residence that will allow more long-term residents and monks to live together, guests to stay for retreats, and space for rituals and gatherings. Please consider giving a donation in any amount by clicking on the convenient PayPal donation button below. Also, please consider making an estate bequest to Ashram West in your will. Ashram West is a 501(c)3 non-profit corporations, and your donations may be tax deductible in the U.S. The Mr. SoCal Leather contest serves as our chief fundraising event every year. 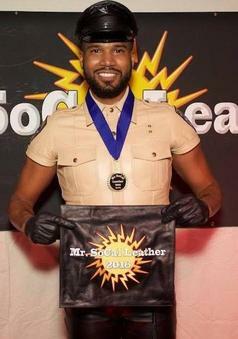 Congratulations to Mr. SoCal Leather 2016, Eric Slayton, who competed with 9 other fine contestants on 2 April 2016 to win 1st runner-up at the Mr. L.A. Leather 2016 Contest Saturday, 2 April 2016. These friendly web sites have been kind enough to help us promote our events.